A lot has happened with Zane Lamprey since he first graced the cover of Mutineer when we interviewed him in early 2009. We interviewed him again just several short months ago and it seems like quite a bit has happened even since then. Most notably is that his new show, CHUG, will premier tonight on National Geographic. Zane has always had a great show, whether it was Three Sheets or Drinking Made Easy, and he alway had a great following. But he also had a hard time finding a permanent home for his show, and that’s probably because it’s hard to convince a conference room full of suits that it’s a good idea for them to endorse a show about someone drinking his way around the world. One way or another, he convinced National Geographic and his new show CHUG, the product of a successful Kickstarter campaign, debuts tonight. 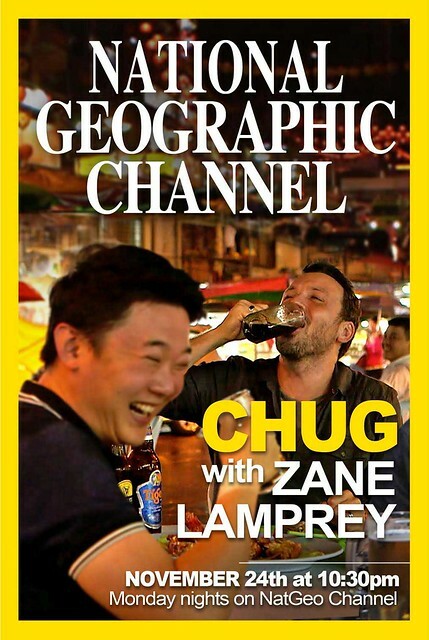 The premise of the show is simple: Zane will arrive to unique destinations around the world by train to explore the local drinking culture. Sounds like a winning combination to me. If that wasn’t enough, Zane also has a Kickstarter running right now for his new project: The Drinking Jacket. What can we say? It’s a beautiful jacket that looks pretty damn functional and we’ll be ponying up to order ours shortly. Others must agree as in just a few day it surpassed its goal and is now working towards its stretch goals. To learn more about CHUG, click here. To view or back Zane’s Kickstarter project, click here.